My younger daughter is autistic. She’s 20 years old, and last week was her high school graduation. The graduation girl wearing her necklace. I think she liked it. She has been living in a special needs group home since age 19, and I have been working to recover my own balance since she was placed. Decades of keeping her safe and getting her the most appropriate education and therapies I could find have left her functioning well enough to be doing great in her placement – but has left me fairly burned out emotionally. I had to keep all my tools and supplies locked up and hidden until placement, as she has no sense of safety or personal space. This state of mind left me at a loss – how do I find closure? Then I realized – I had no graduation gift for her! I started drawing out heart shapes – she likes simple, basic pop-culture things. The heart shape was low, flat and stretched – “it looks like an eagle,” my niece said. And that worked too. I had all the parts ready – can I do this soldering job? This was my first three-layer soldering job. 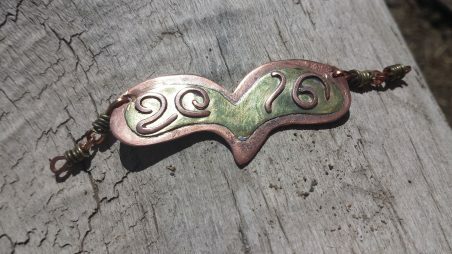 The square wire for numbers “2016” in copper, atop thin brass, atop the copper form I’d cut out. My hands aren’t steady enough to nip tinier pallions of solder, maybe next time I’ll get my niece to do it. But using Rubyflux to set the numbers with their bits of solder in place, atop the brass that I’d soldered to the copper, it all worked much more beautifully than I expected. Yes! And next time I’ll know better about punching the holes for the links. The only thing I’m not happy about. I added two links each side, the square wire with brass wire wrapped around the middles of the links, and stock brass chain (not in photo) to complete the choker. I live on a farm, and this is a very busy time of year – I had to work in 10 and 15 minute snatches but had it ready to go by Graduation night. Blanche, thank you for sharing your beautiful story, how you created this milestone necklace for your daughter. I can so understand how you must have been feeling, faced with both an empty nest and the graduation after so many years of focusing on your daughter’s care and safety. I’m so glad you found your healing in designing and creating this special piece of jewelry. The free flowing heart is interesting with the layered metals. And I especially love how the square wire “2016” numbers turned out – they’re cool and really flow with the heart. What a beautiful, sentimental and I think healing for you, piece of work! I love the design and how in the world did you get those numbers so nice AND soldered so nicely?! Such a special memento and made with such heart! Beautiful keepsake in so many dimensions (physically and emotionally). Blanche, your story touched my heart. You did a great job on the design! You made a heart that your niece said also looks like an eagle. In a way, you gave your daughter your “heart” so that she could fly like an “eagle”. I can’t think of a better graduation gift for your daughter. How beautiful! And a wonderful beginning to now having some “me time”. Keep setting aside a few minutes for yourself. It will help you get yourself back. Colleen, I made the numbers out of square wire, hardened them with the rawhide mallet, then held them to a flat piece of fine grit sandpaper and rubbed in circles – nipped teeny tiny bits of solder, dabbed the backs of the numbers with Rubyflux, stuck the solder bits to that, then stuck them to the brass with the Rubyflux (which has a texture like sticky soft wax.) Then grit my teeth, lit the torch and stroked until the solder flowed, and the numbers just sucked right down. I was afraid of loosening the solder holding the brass in place, but looks like I was careful enough that everything worked. Instead of pickling, I rubbed with Klingspor P400 paper to soften the edges and bring everything down into a softer look before buffing and polishing. Once again, thank you for the good wishes! Best to everyone. You couldn’t have given her any other perfect gift than one that came from your own heart to her heart. What a beautiful story. I work with people who have many types of disabilities, physical or mental and as a hospice caregiver. You have a beautiful heart and know that you have silently been rewarded for all your efforts and sacrifices you made for your daughter. You are truly a blessed person. Blessed be.